Two thumbs up, five stars or something that means this tool works great and is a good value when compared to brands with name recognition. If you want more details, keep reading. 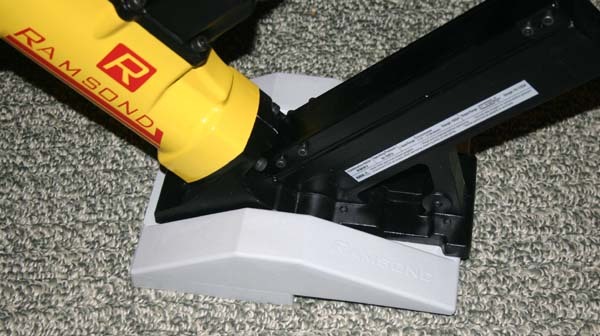 I bought my Ramsond RMM3 off Ebay for just over $200 including shipping. I'd have to spend about that much if I rented one for 4-5 days. In about a month I'll be putting down about 1,000 sq. ft. of bamboo floor. I'll update this page and let you know how it goes. 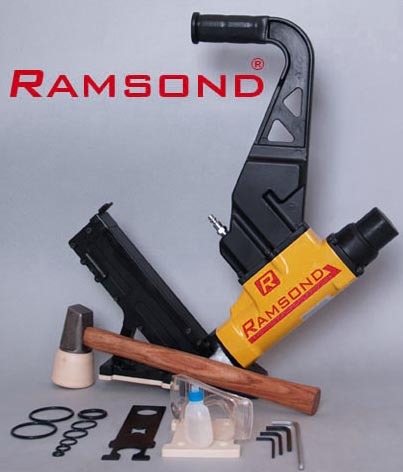 There isn't a lot of info out there on these Ramsond nailers so I thought I'd put up the page I hoped to find. Yesterday I used the RMM3 to staple down two small samples of bamboo floor. The staples I used were Bostitch BCS1512 (1.5" long, 15.5 guage, 1/2" crown). My only complaint is with the shoes that are provided. Neither shoe works well for 5/8" flooring. (Maybe my 5/8" bamboo isn't normal.) I'll try adding some thin washers under the shoe, one on each of the four screws that hold it on. With a slightly thicker shoe I think the gun would side right to where it needs to be for a good shot. As it is now the shoe doesn't hold the gun far enough off the floor. Part of the gun hits the edge of the tounge and has to ride up over the tounge before it hits the edge of the floor. I'm no flooring expert, but it doesn't seem good for it to bump up to the floor in a position where it is really close to right, but not quite there. I've been thinking of trying "The Original Nailer Shoe". I'm still waiting for my drywall guys to finish touching up my walls so I can paint and finally get to the floors. I'm more excited to find out how this gun is than you are! I've put down about 150 sqft of flooring so far. The few times I've ended up with a staple in the wrong place had (much) more to do with the operator than the RMM3. Twice it only put a staple in about half way. I think that was because I didn't hit it hard enough with the mallet. I'm running at 60 psi to get the staples into the bamboo floor and OSB sub-floor. I'm using the "The Original Nailer Shoe" on the gun. For someone who doesn't do this everyday, I think this shoe is the only way to go. It makes the gun so much more stable and it puts the force of the blow on the tongue instead of the upper edge of the board. Since I'm using pre-finished wood, that was a big plus for me. I had to shim the shoe away from the gun with some washers so the gun wouldn't hit the tongue as it slides up to edge of the board. I've put down about 1,000 sqft of bamboo with the Ramsond gun. It worked great the whole time. The only time I had a problem with it was when I didn't hit it hard enough with the mallet. Sometimes in tight places it would only get a tap instead of a good whack of the mallet - it tends to sink the staple only half way. It isn't a big deal, but slows you down when you have to stop and sink it the rest of the way or pull it out. It might be worth putting some thread lock on the screws that hold the shoe on. They tend to work loose and then they stick out and start to scratch the floor. I had to tighten mine several times during the time it took me to put down 1,000 sqft. I'v received a few emails with questions about the nailer. If the rubber bumper/trigger won't pop back up after a shot, or won't move into the up position when you first pressurize it, you may have to grab it and pull it up with your hand. It is also a sign that it needs oil. As with most air tools, if something is sticking or won't seal after a shot, a few drops of oil might be all it takes to fix it.